This entry was posted on March 28, 2011 at 8:28 pm and is filed under Economics, Political. You can follow any responses to this entry through the RSS 2.0 feed. You can leave a response, or trackback from your own site. 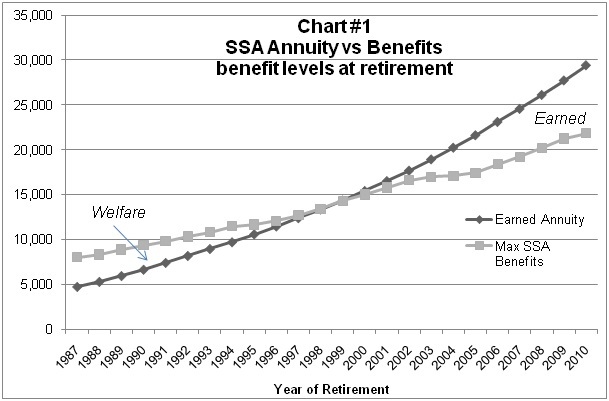 The lost effect of compounded interest on Social Security taxes employee/employer and Medicare taxes totalling now for most almost 15% of total wages is a huge hit on retirement prospects considering the growing gap between paid taxes and benefits received. 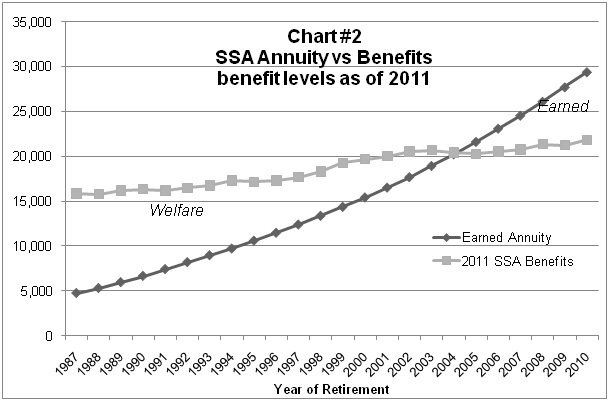 The net return is now for the baby boomers about 2% for Social Security contributions it will be negative for the millennials. For a couple, using just the payroll taxes including the employer contribution who retired today and began their working life in 1972 they would have a nest egg of over $500,000. And that is at mean household income for a white couple. Median income is just below that. They would have saved other amounts and would have health insurance. The couple could have a catastrophic policy with a $10 million limit and a small health policy for expensive tests and prescription drugs. Leaving them with a comfortable retirement without government assistance. While we disagree on whether the employer portion belongs to the employee your point is still very incisive and exceedinly appropriate. By raising the tax rate and the taxable income level to current heights middle class individuals are all but guaranteed to live off the government dole. Recent efforts to raise the retirement age ignore the fact that in 1937 the tax rate was only 1% on the first $3000 of income. If we adjust the retirement age we should also adjust the tax rate and income level to 1% on an inflation adjusted $45,000 of income.